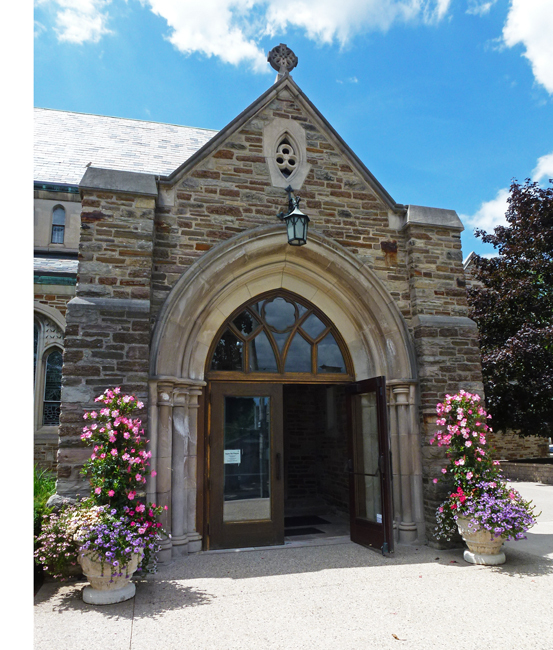 Occasional Toronto: "Open For Prayer"
I was driving by St Clement's Anglican Church in midtown and they had a huge sandwich board out beside this side entrance saying "Open For Prayer". It is so unusual to see a church open during a weekday that I pulled over and went in to find a lovely empty church with no lights on except by the altar. It was beautiful as is this side door as you can see. Have you ever heard the song "Signs, Signs, Everywhere a Sign"? This post reminded me of that. Not only is that door beautiful but, they have it beautifully framed with those flowers on each side. A couple of them here tend to open up for an hour or two around mid-day. There's generally someone inside anyway. An inviting entrance, I would have gone in also to see the interior. What a beautiful looking church, I noticed that door right away, I love it. Perfect time to visit a church. What? No interior photos? Or are you just not posting them yet? Nice that they had a sign out front. How nice! I can't say that I've seen many churches that welcoming. Hello, pretty church. The open door is very welcoming. Enjoy your day and week ahead! It does look very inviting Pat. As you say it's good to see church doors open for those who might be in need of comfort.